LBP (Motor Driven Drum Can Pump) | Products | Daikin Lubrication Products & Engineering Co., Ltd.
• The mechanism of this pump has been simplified, which means that the pump body alone is a light 65 kg or so. • Adoption of an optional lifter enables the drum can to be easily replaced. Note: This pump is basically compatible with the H400 type motor driven pump, which already has a proven track record, consult with us when replacing the H400 pump. 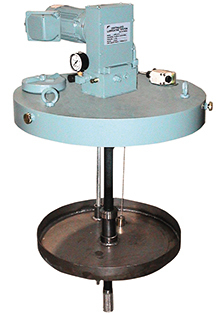 • A replenisher pump is no longer needed as this is a drum can mounted type lubrication pump. • Attachment of a follower plate has reduced the amount of residual grease and allows grease to be used more effectively. • Both single line and dual line systems can be supported as models of this pump are available for both systems. • The suction performance of high-viscosity grease has been improved by adoption of a piston valve system at the suction port and enhancing cut-off performance. Grease used NLGI No.0 to No2.